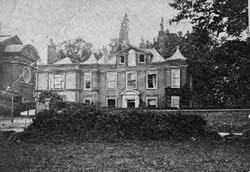 Dial House was owned by members of the Twining family from about 1722 until 1889. Thomas Twining I bought the property and either rebuilt, or converted and extended two small buildings already on the site. The sundial on the fa�ade carries the date 1726, possibly commemorating completion of the new building. Tradition has associated John James with the design and execution of the house but there is no documentary evidence for this. Although the house remained in the family, it was leased to tenants from 1834 until 1866 when it was occupied by Elizabeth Twining until her death on Christmas Day 1889. Her wish that the property should be given to the parish for a vicarage was honoured by her brother Richard. A survey by A Y Nutt of Windsor showed the need for extensive repairs before it could be occupied as a vicarage. £350 was donated by Richard Twining, £100 by Louisa Twining and £100 by Thomas Twining IV. A grant of £300 was received from the Bishop's Fund and the work was carried out by T J Messom. The Vicar, the Rev Richard Tahourdin had already moved out of the Old Vicarage, now in poor condition: there were plans to replace it with a new building at the west end of the Garden of Remembrance where it stood. He moved into Dial House, from Neville House, his temporary abode, in January 1892. 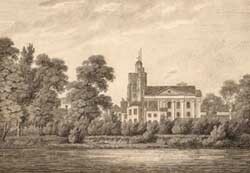 The Old Vicarage was now demolished, opening the view of St Mary's Church from the river. The house was probably built before 1635, the date of Moses Glover's map where it is described as "Ye Vickeridg Mr Goose". Thomas Goose was Vicar from 1595 until 1640 when he died.